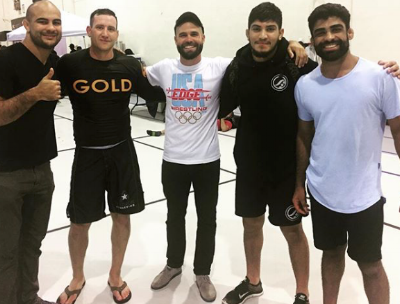 The IBJJF No-Gi Pan Americans was this past Saturday, October 1. Held at the City College of New York, the room was filled with some of Brazilian Jiu Jitsu’s finest —Garry Tonon, Gordon Ryan, Karen Antunes, Rolles Gracie, and Ricardo Almeida among the competitors and spectators. Dillon Danis, a black belt under the famed Marcelo Garcia, won double gold at the event, both in absolute and his medium heavyweight division. Onlookers watched as he executed an impressive kneebar in his first match (one of his trademark techniques) and continued to submit the rest of his opponents. It’s just another accolade for the Alliance athlete, after an exciting year. Most recently in the limelight for training Jiu Jitsu with UFCFeatherweight champ Conor McGregor, Danis spoke candidly with NYF about what is coming next for him. Sitting quietly in a corner of the gym with his teammate Mansher Khera of the Marcelo Garcia Academy and wrestling coach Jeff Marsh of the Edge Hoboken, Danis was inconspicuous in his black hoodie as he watched other athletes walk by. It wasn’t just his teammates and coaches that helped him however. The most notorious Irishman in MMA today, Conor McGregor, was also a part of his success. Danis spoke nonchalantly about how he “was in Ireland and Vegas for a lot of this camp. Conor and I have a very good relationship and we help each other out a lot. He definitely helped me to prepare for this tournament and it felt really good to get out there and win.” Danis had trained with McGregor for one of his most hyped up matches to date, UFC 202, against Nate Diaz. It appears he may be doing so again for McGregor’s upcoming bout at Madison Square Garden. Danis had a smile on his face as he spoke about his passion for Jiu Jitsu. After training for several years, the black belt has seen many positive changes for himself. “Brazilian Jiu Jitsu changed my life as a little kid, and I’ve been very lucky to have the opportunity to travel all over the world for BJJ. As a martial artist, my life has completely changed. I am the person I am today because of Brazilian Jiu Jitsu. It’s all a part of me, the things that I have seen and the things that I have been through.” The 2014 Abu Dhabi Pro champion knows that he has gained so much from the sport. While Danis’ name rapidly grows in notoriety due to his training partners and academy affiliation, the athlete remains humble about where he came from as well as his skills today. Unexpectedly, he is reserved but firm, and is focused on his future. Despite winning gold at the tournament, he has his sights set for his next competition and what he wants to accomplish there. The New Jersey native is still very young and has many more dreams he would like to fulfill. However, he uses his past experiences as opportunities to shape his future.